I am starting to write this article whilst we are snowed in AGAIN on 19th March. The Narcissus 'Tête-à-tête' and 'Jetfire' flowering in pots had just been gathered from their various overwintering spots and clustered up near the house with some primulas for springlike effect when they were buried under 10 cm of snow. I can just see a couple of yellow petals. Will they have been flattened with the weight of the snow for the past three days, after they cleverly missed the first snow and ice at the end of February, postponing their flowering until mid-March? I can report that both the very short Tête-à-tête and the taller Jetfire have bounced back with no discernible distress as the snow melted, and their flowers are just starting to go over now at the beginning of April. 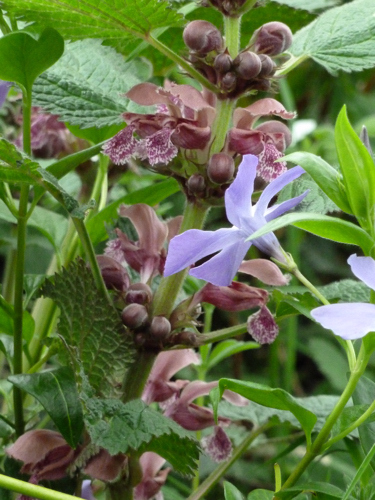 What resilient plants. 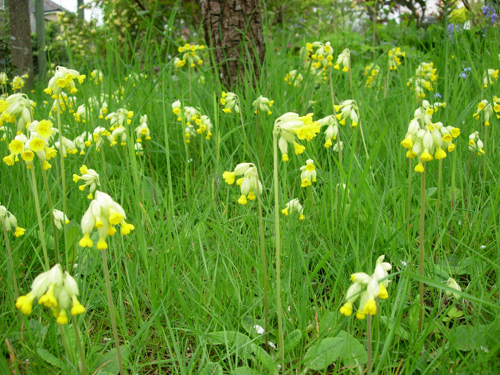 Let me turn my thoughts to cowslips and other spring flowers. 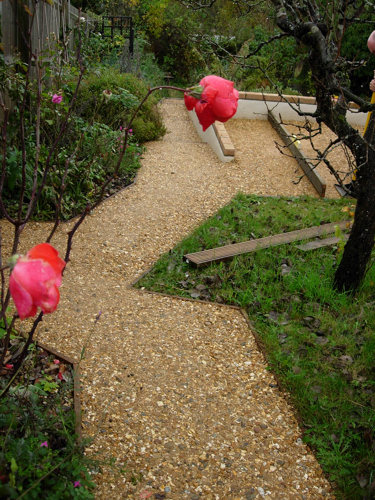 Just past the pear trees that are at the far end of the rose garden, the hillside slopes away in a steep grassy swathe. 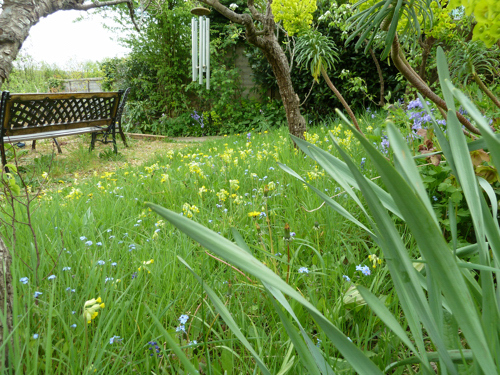 This grass must originally have been “lawn” but had over the years reverted to a rougher sward, speckled with wild flowers, particularly of horticultural note – cowslips (Primula veris). Whilst they are sprinkled in patches all down the area, they were particularly prevalent under the pear trees, and this gave me an idea. 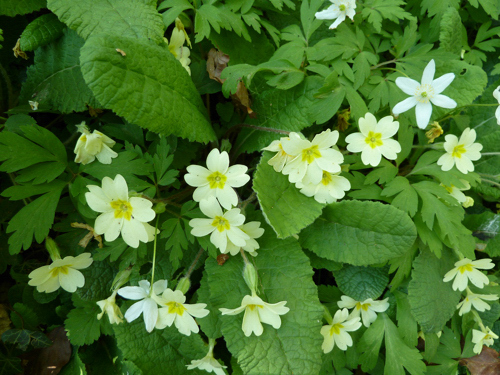 The back of the rose bed was under the trees, with the Rosa xanthina ‘Canary Bird’ growing up into the Conference Pear tree so I would plant spring-time woodland plants towards the back edge of the beds, and I would encourage a cowslip meadow under the trees. 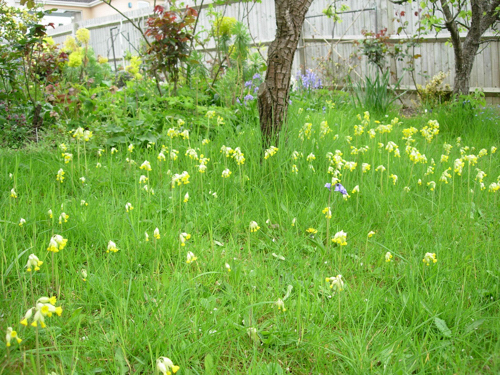 Above you can see how thickly the cowslips bloom under the pear trees in April. We had put our patio set just past there as there was a magnificent view across the Avon Valley at that point. Being on a steep slope we got used to only pouring half a cup of tea from the thermos as we rested there, as the table was on such an incline. 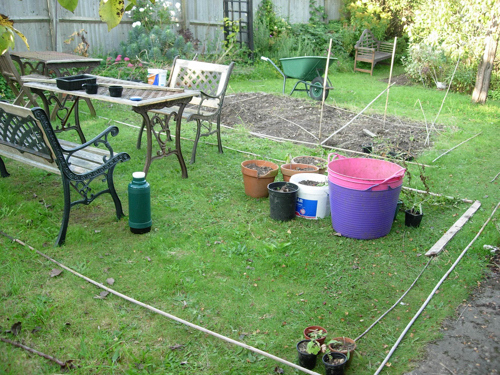 Perhaps you can see that in the picture below as we mark out where we wanted the patio with canes? Please note that my husband would like me to make it clear that the “meadow” is the patch of grass by the trees you can see above, not an actual meadow, in case anyone was going to report me under the trades descriptions act! 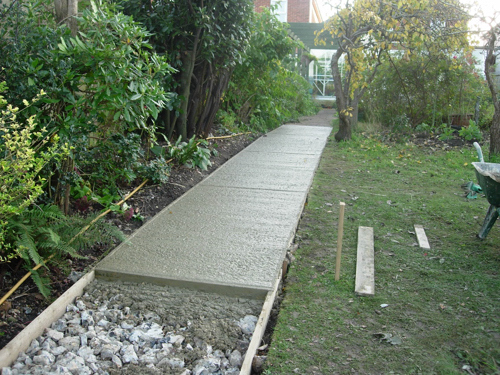 You can see that the concrete path on the left of picture is clearly new – the very first thing we had to do was replace that section of the utility path, which you may remember we had only replaced to a point past the pergola beside the Weigela ‘Bristol Ruby’ but not as far as the pear trees. For this, I got my new concrete mixer!! 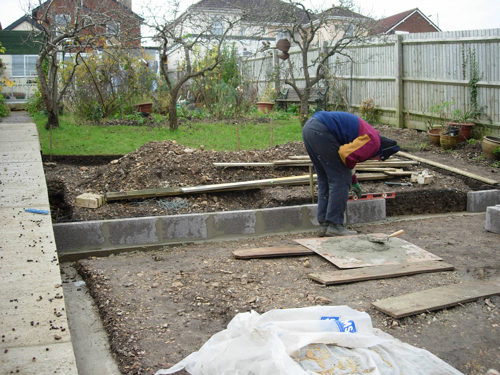 Here it is being constructed – can you see the concrete mixer hiding behind the pear tree? On the other side of the garden we would continue the hoggin path that we had arbitrarily stopped short of the pear tree under the pear tree, and onto this new patio which would also be of hoggin, so that you could walk through the rose garden and arrive under the bough of the pear tree to the patio and the fantastic view. 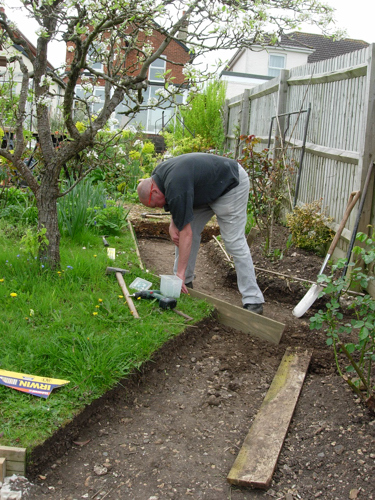 The pictures below show cutting out that path, and the path and patio with hoggin being tamped down. As you can see the Aquilegia vulgaris I grow from my own saved seed are about to burst into flower, and even towards the end of April the Helleborus x hybridus flowers hold on as they set seed. 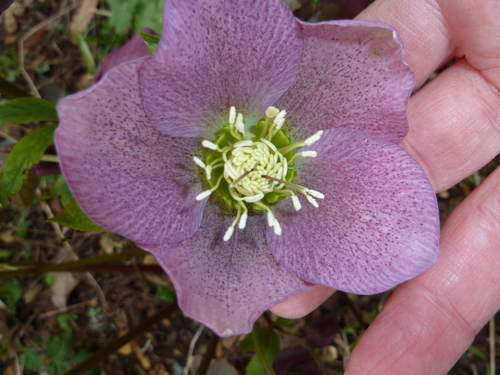 I ringed this bed with hellebores – one white one and several pink seedlings from my original Helleborus x hybridus plants. 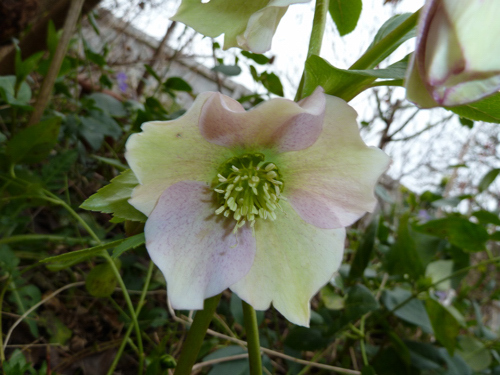 Technically, I suppose the hellebore is a winter plant, but it flowers for such a long time it is still in flower in April here. 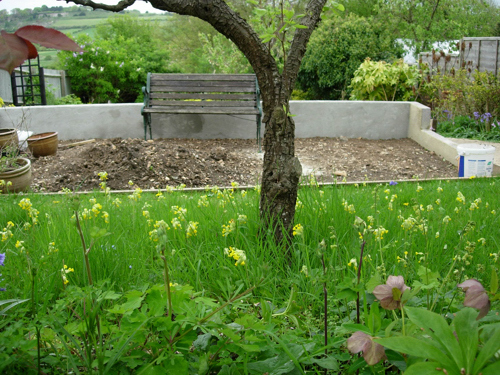 The back of the rose bed had originally been square, and we developed it to be a curved almost semi-circle shape across the width of the garden by transplanting turf which had the most concentration of cowslips from further down the slope. 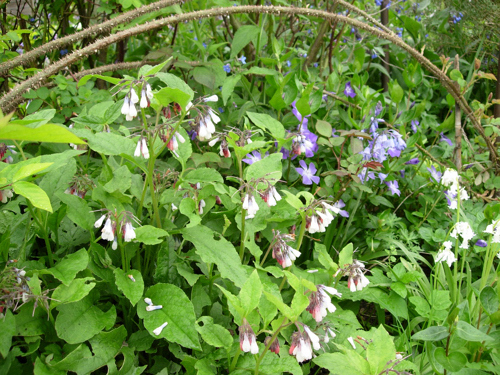 The idea was to soften the edges so that your eye didn’t notice the transition from border to cowslip meadow when it was in full flower. 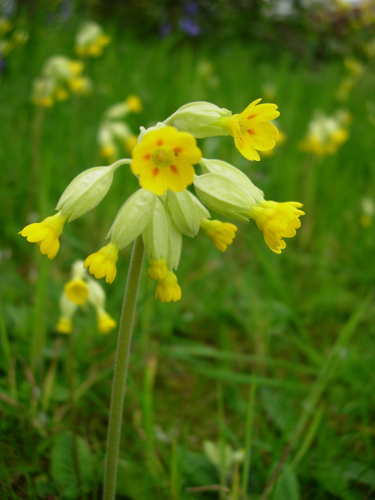 The first picture below is of the inserted grass to soften the edges, and then a close up of a cowslip. 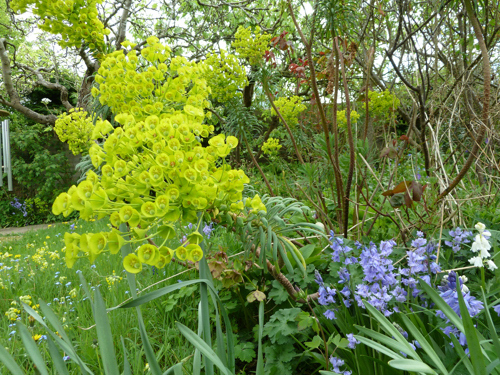 Early spring flowering for me is citrus green/yellow and blue – from the Euphorbia characias subsp. 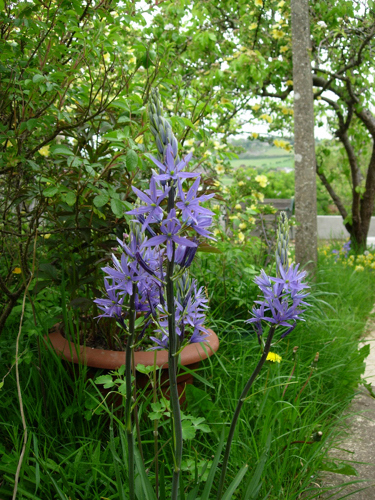 wulfenii flowering with the grape hyacinths initially, then the daffodils and cowslips, Canary Bird rose, camassias, hyacinths and bluebells. 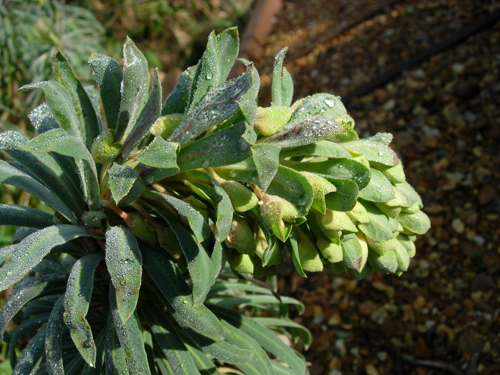 Here the euphorbia is on 10 May 2013 still flowering beautifully. 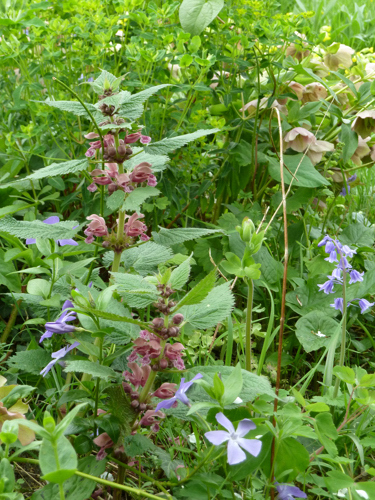 (If you look closely above to the left you may notice some creeping speedwell (Veronica filiformis) amongst the cowslips that particular year – not something that happened again). The cowslip meadow I treat like you would a wildflower meadow in that I let the plants set seed, and wait til the seedheads dry naturally to help them disperse. This drives my husband wild, as it means the grass cannot be cut until late summer. I have helpfully positioned the bench looking away from the meadow on the patio, but I am under orders to explain why this bit of grass has been left long to any visitors who come lest they think he just forgot to cut it. To further help the cowslips disperse their seed naturally, my husband scythes the grass and rakes it up for me to take to the compost bins when it gets its first cut. 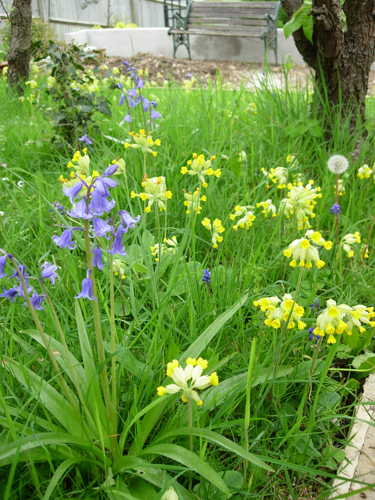 I have to police thugs out of the grass, like plantain and dandelion which are constantly threatening to overwhelm the cowslips, and make sure it has a cut in early spring before the leaves of the cowslips are more than tiny rosettes flush to the ground so that the grass is not too long for the cowslips to flower in. All mowings are removed to help reduce the fertility of the grass (which obviously doesn’t get fed). The problem with a hoggin path and patio and grass left til late summer until it is cut is that the grass sets seed, and seeds extremely readily into the hoggin patio – if you look to the upper left of the picture below you can see the grass (and plantain and dandelion most likely!) growing under the table and bench on the patio where we don’t walk as much. Note to self, weed the patio more frequently! 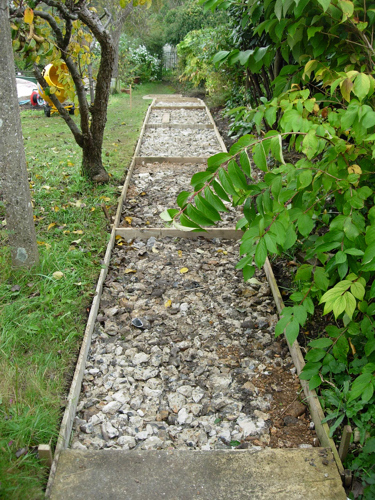 I will talk about the other garden features we terraced into the hillside below the patio another time. Next time sowing seeds and growing kale. 0 Comments To "On a Chalk Hillside April 2018"